We believe that nature teaches us to cultivate pure and humble minds and see the world without rules and boundaries. 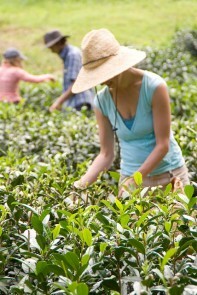 Our goal is to grow and process teas of exceptional purity and cleanliness and educate people about these qualities. As wholesale partners we would like you help you meet your sales goals and are available to help you understand the production, usefulness, and unique experience embedded in the fine nature of our products. To send an inquiry about setting up a wholesale account please fill in the requested fields below. We will contact you to verify information and set you up for making wholesale orders online. Also feel free to call us any time at 808.775.1171. We are interested in the nature of your business and what we can do to help you meet your goals. Please note that we will do our best to respond to your inquiry promptly but during harvest seasons, do expect some delay. We look forward to taking this journey toward a richer tea experience with you. Please complete and upload this Form for resellers in the state of Hawaii.